The Golf String is one of the simplest, easiest to use and most effective wire running devices to pull wire across spans, beams or other large spaces. Just throw the ball across the span or over a beam, tie on your wire, and pull your wire back. The Golf Ball String contains 100ft. 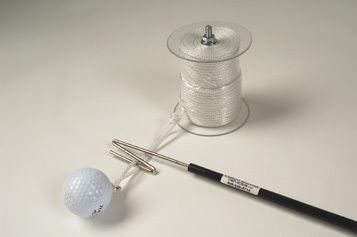 of very strong nylon cord, a golf ball with an eye screw and a useful carrying spool. The unique method of routing the cord through the eyelet allows the installer to easily slip the cord under the golf ball and out of the eyelet when the golf ball is no longer needed (after the cord has been run). Easy to use and simple with low maintenance construction. Durable and long lasting cord.